When it comes to major fall releases, few phones carry more weight than Samsung’s Galaxy Note series. Unfortunately, Samsung’s handling of the series hasn’t exactly been perfect over the last couple of years. The company made its first misstep with the Note line when it failed to offer the Galaxy Note 5 in Europe, despite a petition asking it to do so. Fast forward a year, the smartphone battle heated up as Samsung found itself on the end of some very unwelcome publicity. Despite making what many were calling the perfect smartphone, the Galaxy Note 7 proved that some things are too good to be true and a global recall later, the industry moved on from Samsung’s late-2016 flagship device. So is 2017 the year the Note line gets back on track? We certainly hope so! While there’s lots to take in, in this post we will focus on the biggest takeaways you need to know about the brand new Samsung Galaxy Note 8! At first glance the Galaxy Note 8 seems to share the exact same design seen earlier this year with the Galaxy S8 and Galaxy S8 Plus. There’s the infinity display, the on-screen keys, IP68 water/dust resistance, and the same Bixby key. Don’t let the first look fool you though, the Note 8 brings several new layers of polish that helps the handset stand a step above its older brothers. While the Galaxy S8 and S8 Plus are no doubt two of the best looking smartphones on the market right now, they aren’t the easiest to hold. Thankfully, the Note 8 improves this with a slightly thicker and wider design, despite containing an even larger display than offered with the S8 family. The Note 8 brings several new layers of polish that helps the handset stand a step above its older brothers. Like the Galaxy S8, the Note 8 has curved edges to the left and right side of the displays as well as on the rear. The key difference is that the curves have been dialed back a little, resulting in a smartphone that is a little squarer than its Galaxy S8 siblings. Another difference is that the slopes are stepper and more aggressive, resulting in a distinctly different in-hand experience. There’s no denying that at 162.5 mm tall, the Galaxy Note 8 is a massive device and it certainly feels that way in the hand, although there is a certain allure to it. Compared to the Galaxy Note 7, the handset is a little taller and a little thicker (at 8.6mm), but feels familiar, albeit with a much larger display. The fingerprint scanner still sits in the same odd position. Despite much chagrin at the location of the fingerprint scanner on the Galaxy S8, Samsung didn’t have time to change the position for the Galaxy Note 8. The good news is they did manage to add a slight lip around the sensor which makes it easy to locate without looking. While most users will still prefer the front or rear-center location found on most other handsets on the market, this little change at least makes Samsung’s solution a bit more palatable. Four colors to choose from — technically. With every smartphone release, Samsung tends to introduce variations in the available color options and the Galaxy Note 8 is no different. This year, you’ll be able to pick up the handset in the familiar Black, Maple Gold and Orchid Gray (although the latter is distinctly different to the Orchid Gray Galaxy S8), as well as a new Deepsea Blue option. All of the devices come with a Black front however, which allows for a combination that lets certain colors, such as the Maple Gold, stand out from the rest. The Deepsea Blue is arguably the most unique of the bunch and provides a blue that is reminiscent of a perfect blue ocean. Now for the bad news: once again, Samsung is only releasing certain colors in select markets. 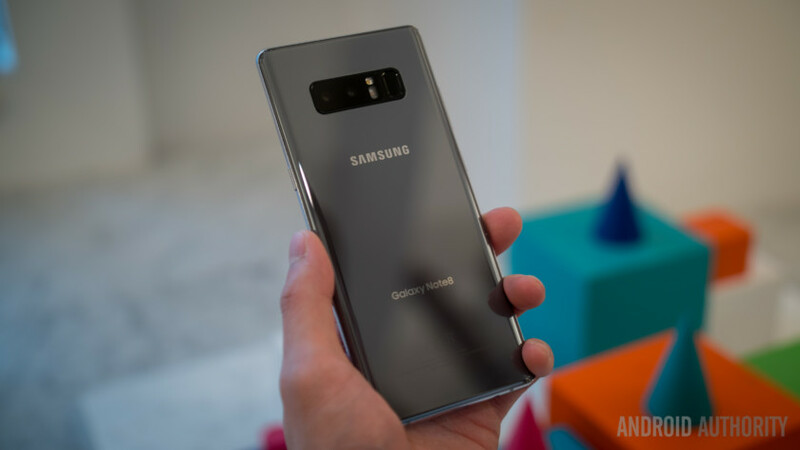 The US market will only get the Midnight Black and Orchid Gray colors for carrier and unlocked versions, and Samsung has not confirmed which markets will get the Maple Gold and Deepsea Blue color options. Samsung Galaxy Note 8 brings all the high-end specs you’re craving. As you’d expect, the Galaxy Note 8 is packed to the brim with all the very best specs. Just like with the Galaxy S8, the Note 8 is powered by the latest Qualcomm Snapdragon 835 processor in the US, while the global model gets the latest Exynos 8895 processor. Looking further under the hood, the Note 8 comes with 6 GB of LPDDR4 RAM and either 64 GB, 128 GB, or 256 GB of on-board storage depending on your market and carrier. There’s also micro SD card support, which allows you to expand the storage further by up to 256 GB. Of course, the real star of the Galaxy Note 8 has to be the new display, which follows the Galaxy S8 and uses 18.5:9 aspect ratio to deliver incredibly large real estate for a phone this size. The display is a 6.3-inch Quad HD Super AMOLED Infinity Display which, despite a similar profile to the Galaxy Note 7, is over half an inch larger. Like the Galaxy S8, the display also comes with a mobile HDR Premium certification from the UHD Alliance. Turning to connectivity, the Note 8 offers Bluetooth 5.0, WiFi ac, 1024QAM for Quadrature amplitude modulation, and NFC, which combines with MST to offer a multitude of mobile payment options using Samsung Pay. There’s also Gigabit LTE, which promises to offer speeds of up to 1 gigabit per second on supported carrier networks, although it’s not clear if there’s separate variants of each carrier like with the Motorola Moto Z2 Force. Smaller battery, hopefully less flames. The flaw that eventually signaled the end of the Galaxy Note 7 was that Samsung reportedly used a faulty battery and tried to pack too large a capacity into the handset. This time around, Samsung is being a bit more cautious, offering a smaller 3,300 mAh battery. While this isn’t the largest on a smartphone of this size, it should be enough to see you through a full day’s usage, although we’ll reserve judgement on the battery life for our full review. Samsung jumps onto the dual camera bandwagon. Following the dual camera trend we’ve seen with just about every 2017 flagship so far, the Note 8 is the very first Samsung phone to offer a dual configuration, and also the first smartphone to support Optical Image Stabilization in both lenses. For its dual camera setup, Samsung has opted for a telephoto camera combined with a wide-angle camera, which it says allows it to create bokeh effects in photos. The telephoto camera is a 12MP autofocus sensor with f/2.4 aperture while the wide-angle camera is also 12MP and has f/1.7 aperture. The wide-angle lens also comes with a Dual Pixel sensor with rapid auto-focus, which allows you to capture sharp and clear shots in all lighting conditions. Following the dual camera trend we've seen with just about every 2017 flagship so far, the Note 8 is the very first Samsung phone to offer a dual configuration. Android Nougat is onboard, but Oreo shouldn’t be too far behind. With Android 8.0 Oreo already rolling out to the Nexus and Pixel families, it might seem a bit unfortunate that Samsung’s new flagship still rocks Nougat. The good news is that Google has announced it is “working closely” with OEM partners to release Oreo “by the end of 2017”. Samsung was one of the OEMs listed, meaning that Oreo should hopefully arrive no later than December 31st. App Pairing is a new addition to Samsung’s Edge UX software and essentially allows you to set up custom shortcuts of paired apps that can launch into Multi Window with the tap of the shortcut icon. For example, you could set up YouTube and WhatsApp, Messaging and Chrome or any other combination and save it to the Apps Edge or your homescreen. When you want to use both apps together, simply tap on the shortcut and it’ll launch both straight into MultiWindow. While Samsung’s Bixby might not be considered a must-have feature (depending on who you ask), Samsung certainly isn’t giving up on its voice assistant. Bixby essentially remains identical to the experience found with the Galaxy S8, Galaxy S8 Plus, Galaxy S8 Active, and the Galaxy Note Fan Edition. Like the S8 series, you also get a physical Bixby key. The S-Pen makes its glorious return. It wouldn’t be a Note without an S-Pen. While the outward design hasn’t really changed since the Note 7 days, it does come with a few small improvements to last year’s S-Pen software, alongside one new main feature. The new feature is called Live Message, and it allows you to handwrite a message, add special effects, and save it as an animated GIF that can be shared using any app that supports gifs. This can be a rather unique way of sending a message to a friend or loved one on a special occasion such as their birthday or a celebration. Samsung DeX lets you transform your phone into a desktop machine. The Samsung Galaxy S8 first introduced the concept of DeX, a special adapter that allows you to hook up your phone to a monitor and get a desktop experience, complete with a modified version of Samsung’s UI designed to take better advantage of larger screens. DeX returns with the Note 8, but not without adding a few new tricks first. Samsung says they are introducing broader app support, including the ability to start a video conference on the DeX desktop but continue things on-the-go directly from the phone. All without skipping a beat. Samsung also boasts it is working with select mobile game developers to optimize their experiences for the desktop. An example given is Vainglory, with developer Super Evil MegaCorp partnering with Samsung to optimize the game for DeX and offer a desktop-level gaming experience when docked rather than the mobile gaming experience currently on offer. Samsung’s Note 8 gets a new Gear VR variant, but not really. The Note 8 will feature its own version of the Gear VR, but it’s really no different from what we saw earlier this year. That means the same overall design, as well as those slick motion controllers. The only real difference? It now supports the larger size of the Galaxy Note 8 display. The Galaxy Note 8 will go up for pre-order tomorrow, August 24 ahead of its US launch on September 15. The Samsung Gear VR will also hit stores on September 15th, priced at $129.99. You’ll note that we haven’t mentioned pricing for the Note 8, and that’s because Samsung has yet to confirm the exact cost. We do know that rumors suggest it could be the priciest Note yet, but we can’t say for sure until Samsung confirms this. While the key points above give you a pretty solid idea of what Note 8 has to offer, if you want to know even more — we have your back! Dive into the specs. Want to know the deeper ins-and-outs of the Note 8’s spec sheet, from known carrier bands to colors, and more? You’ll want to head here. Go hands-on with the Note 8. Join Josh as he gives us his first hands-on impressions of the new Samsung flagship. Pricing and availability. You’ll want to bookmark this page, as we’ll continually update it as more carrier and regional release details come in over the next few hours, days, and weeks. Are you excited by the Galaxy Note 8? Did you have a Galaxy Note 7 and do you plan to buy the Galaxy Note 8? Or does another device take your fancy? Let us know your views in the comments below!